The forest has its hobgoblins. One day, in my seventeenth year, we were wading through German music history at school, and we arrived at the Erlking. We stood at his forest door courtesy of Goethe and his poem, and Schubert and a song I should not ordinarily have troubled about. The Erlking started out in Norse mythology as the daughter of an elven king, but transmuted somewhere along the way into a male hobgoblin, an elf of such acid malevolence that he has supernatural power to manipulate well beyond the grave. And Schubert’s story runs thus: a little boy is riding home on the back of his father’s horse, clutching his father’s waist, when he sees the Erlking way in the distance behins him. But terrifyingly, the gap is closing. And somehow, the Erlking has the power to talk to the boy; to wheedle him and coax him into leaving his father and coming with him. And this deeply Teutonic tale ends badly. Horrifically, in the manner of nightmares. The father clutches ever tighter to the boy, listening and responding to his fear and plaintive cries. By a superhuman effort he gets them to their destination, an old farmhouse. But the boy is dead in his arms. It’s a very tangible metaphor, that one. Not difficult to read; unequivocal. In life fear happens. And when we have something of which we are really afraid, we spend our time looking over our shoulder and warding off the Erlking. Sometimes we have a loved one with us; some times we are alone in that forest as the Erlking gets nearer, and nearer. No one ever asks the question: what would happen if the father turned round and fought the Erlking for his son’s life? What then? Life is not a fairy tale. Turning and walking head-on into your fears is a strategy advocated by the self-help books, and it sounds like an excellent idea. We are gripped by the idea that if we could just sum up the courage to turn round and roar in rage at our Erlking, why then, we would be victors. Wisdom is knowing the difference. When to stay and fight, when to turn and walk away. I have been chased by the Erlking for a very long time. I know Erlking management. And I know now that sometimes you fight him, sometimes you take yourself out of that situation to a farmhouse. And make very sure you are not in that forest at dusk ,with the person you love most, ever again. I realise, for my own part, that unconscious refrain: “My Father, My Father, the Erlking’s getting nearer!” has subsided in the last few months. I have been permitted a rest. In my daily life I experience both fear and pressure, just not the pernicious evil mind games of the Erlking. From the safety of my farmhouse, I know he is a part of the world, a creature I must deal with. But he is far away for now. And perhaps now is the thing that matters most of all. 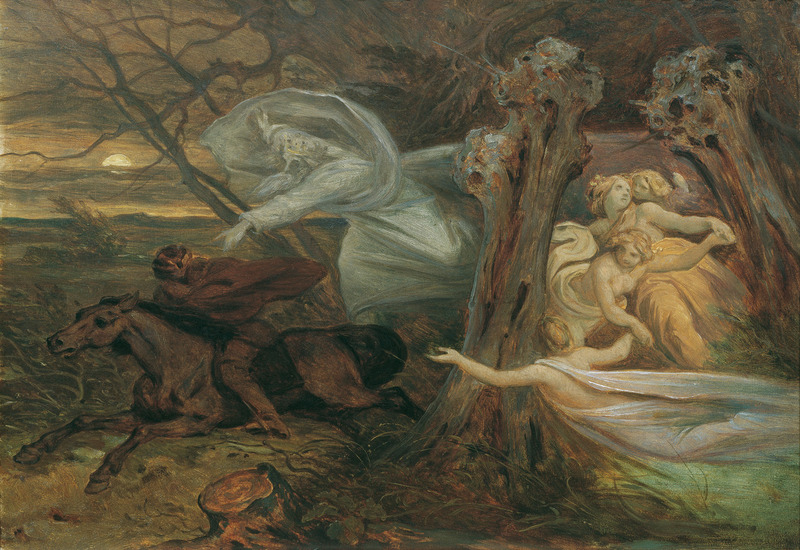 Posted in Folk talesTagged classical music, elf, Erlkönig, hobgoblin, Schubert, The ErlkingBookmark the permalink. He lurks, ever present for those who know him. Sometimes right in our path, sometimes he is just a distant voice in the forest. And often it is standing with that loved one that helps send him on his way. Thanks, Sidey. He’s not even a whisper on the wind right now. Lovely. The Erlking… Oh dear, it sends shivers down my spine. It is such a powerful poem. The father tried to help his son by outrunning the Erlking, unfortunately it was not in the power of the parent to save the child. It is a chilling reminder, that one has to fight ones own battles. Is is, Dede, you hit the nail on the head. Fear can isolate us so. Oh, Kate . . . what a phan(tom)tastic tale. If the father hadn’t clung so tight, this son would have been able to breathe. And breathing is key when our mind wishes to whisk us into the darkest doom and gloom of the twilight forest where our fears hold sway. Facing our fears is not always the most prudent course of action. Sometimes, as you say, it’s better to turn and walk away ~ putting as much distance between us and them. Beautiful words, Nancy. I wasn’t sure how you’d feel about this one. I love the breathing thought. So true. Life is never one-size-fits-all . . . all “self help” advice must be custom-tailored to suit us and our personal proclivities, predilections, and priorities. I am so glad that Eriking is not even a whisper in the wind for you right now. May your battle continue to be successful. Kate, I hope your respite continues indefinitely. Though I don’t know everything you’ve had on your plate, the things I do know make this respite from the Erlking well deserved. Thank you, Andra. I think perhaps the Erlking is a thing some have but not others: a disposition towards chronic anxiety. We have to work much harder to be glass-half-full people. I sensed you’d have an idea what I was talking about, Brett. Sounds like you are in a better place Kate and writing it out and breathing as Nancy suggests are both great strategies to keep you there. Yup. Though fear is a part of life for everyone, I suppose. There are many paths to handling it. Thought of you as I wrote the post for tomorrow morning, Have you heard of Nadorcotts? Do you grow them in your neck of the woods? No but enjoyed your post. I have one of the very seedy trees in yard! Kate, I’m very glad to hear that your personal Erlking is further in the distance. I hope the day comes when he quits chasing you. He’s part of life, Lame; and his flipside is the ability to create, in however small a way. I wouldn’t give that up, so I live with the hobgoblin as best I can. Then, there is a positive of sorts to the wretched beast, Kate. Compassion helps – don’t forget it can be for oneself also, quite different from self-pity. Those old myth-makers certainly knew something didn’t they? I love that, Elspeth; and in fact the best way to distance him has been, I have found, to quietly list three things I feel I have done well each day. I have no idea why it works, but it does. Yes: the Norse myths are elemental. Oh, I like that idea, Kate. We often overlook the things we do well. Fear is a terrible thing, Kate. I hope the Erlking keeps well away from you, and never catches up. There’s a balance about his presence, Tom. I was saying to Lame that it is the flip side of being able to create things, and I’d rather live with the Erlking and have the pleasure of creating in my life, than be fearless and dull. This is so beautifully haunting and honest–very personal sharing, Kate. It brings tears to my eyes. Thankfully my life has been spared from too many moments of real fear, but I have had a few, and it doesn’t take much for me to bring them close. Standing up against the hobgoblins in our heads isn’t easy. Thankyou, Debra. I certainly do. Our blogging friends are a special bunch. I had a strangely vivid nightmare as a child, which had a great influence on my thinking. I was outside a typical old farmhouse with an open space beyond the verandah, fringed by great trees. Then I became aware that the trees were filled with enormous snakes, and they were converging on me. I fled in terror to the farmhouse, but now one was coming in after me, and forcing its way through the door. The terror intensified. Suddenly it was replaced by cold fury. How dare the snake terrorise me thus? I picked up a chair and swung it at the head. The great serpent fell and started retreating, with me in pursuit and still bashing. As I got outside, I saw that all of them were fleeing. I had a feeling of relief and triumph, and then I woke up. It certainly gave me a strong feeling that facing fears head-on – and with anger – can be effective, and I must say that it has stood me in good stead when, for example, I have been attacked by armed muggers on a couple of occasions. What is it about German myths? They sneak into the cracks in even the sunniest souls. I’m sorry you’ve been in a bad place, Kate, quite glad to hear you’re having a break. May it last a good, long time. I am so glad you are in a safe place now Kate. May the Erlking stay away forever. Take care and stay well. Am very glad that you have been permitted a rest, Kate. Too long facing off the Erlking in the forest kills many a thing. Long may your rest last. Kate, I’m glad that you can distance yourself from your worries and pray that you’re in much better health and spirits. This statement can be applied to all of our “common difficulties.” May we all overcome the challenges and emerge stronger for it.